U.S. President Barack Obama has some less-than-laudatory words for Canada's oil industry in a new example of his increasingly critical take on the oilsands. He was asked about the Keystone XL pipeline during a town-hall session Friday — and he launched into an explanation of why so many environmentalists oppose it. "The way that you get oil out in Canada is an extraordinarily dirty way of extracting oil," Obama said during the event at a South Carolina college. "Obviously," he added, "there are always risks in piping a lot of oil through Nebraska farmland and other parts of the country." 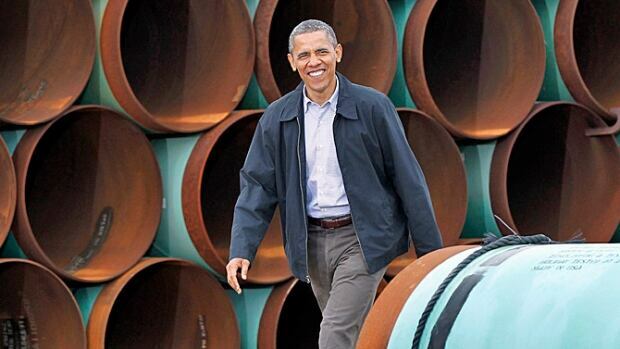 Obama has recently taken to dismissing the Keystone XL pipeline, playing down its benefit for the American economy. But his remarks Friday at Benedict College were notable in that they were aimed at the industry itself. It came during a question-and-answer session where a student saluted him for vetoing a bill to build the pipeline: "Thank you. Thank you. Thank you," said the questioner. "You are what we hoped for." Obama replied that his decision to veto the bill wasn't the last word on the matter. He said he hasn't made a final decision. But then he proceeded to launch into a statement on climate change. He spoke about what he called a catastrophic threat, with possible wildfires, rising sea levels, crop losses, drought, hunger, war, and the spread of insect-born diseases like malaria into the U.S.
"This will affect you more than old people like me," he told the students. "The disruptions — economic, social, security disruptions — that it can cause can make your life and the lives of your children much harder and much worse. And if you don't stop it at a certain point, you can't stop it at all. And it could be catastrophic. "What I just described, it's not science fiction, it's not speculation, this is what the science tells us." The Canadian government has consistently pointed out that the Obama administration's own environmental reviews suggest the Keystone XL pipeline would mean lower greenhouse gases than transporting oil by rail. Alberta's envoy to the U.S. also challenged Obama's remarks about dirty Canadian oil. "He's, I would say, reflecting some special-interest groups that have been telling him that," Rob Merrifield said in an interview. "We encourage him to look at the facts of the matter on this — and to work with us, as Albertans and Canadians, to be world leaders in environmental protection." He said Alberta doesn't get the credit it deserves for drastically lowering emissions per barrel; for its work to reduce emissions through flaring; for spending $300 for every Albertan on carbon capture; and for being the first North American jurisdiction to put a price on carbon and use it in a clean-technology fund. Merrifield said there's still progress to make. Last year, the State Department concluded that Canadian oil emits 17 per cent more greenhouse gases than the average barrel of crude refined in the U.S. in 2005. "We haven't arrived. We haven't said we've arrived," Merrifield said. "(But) we are certainly first in class in many areas and are working hard to continue to improve." Canadian oil proponents say it now compares, even favourably in some cases, in emissions intensity to other heavy crudes refined in the Gulf of Mexico — especially Venezuelan oil. And unlike Venezuela, Merrifield said, Canadian oil comes from a stable political source and an ally.